Circlips sit in a groove on the shaft to prevent any pulling or pushing motion from dislodging it. 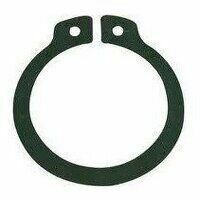 External circlips are those positioned on the outer surface and we stock many different types here at Bearingboys in packs of 10 or 100. Our external circlips are suitable for most normal engineering applications, providing a rigid, resilient, load bearing shoulder on the shaft. Most are made from carbon spring steel which is austempered to ensure optimal ductility at the high hardness values necessary for correct functioning. You can search through our range according to shaft size, thickness, internal diameter or groove diameter.